A high handicap golfer is generally accepted as someone who has an official handicap of 18 or over. Usually, a high handicapped golfer is relatively new to the sport or someone who plays occasionally and hasn’t entirely honed their skills on the golf course. When you are playing in this handicapped category, you need all the help you can get to ensure that you develop your skills and stay committed to the game. Selecting the best ball when you are a high handicap golfer will make the difference between a successful day’s golf or 6 miles of stress and anxiety. Construction of golf balls vary, with different materials and layers giving the ball different properties. As a beginner, it is essential to get a ball that produces very straight drives with reasonable distance. At the same time, you want a ball with low spin to compensate for any anomalies in your stroke such as the tendency to slice or hook. Let’s look at three options for the contender of the best golf ball for high handicap golfers. Callaway needs no introduction in the world of golf. They have been making quality golf products for many years and have been the staple of many pro tour golfers across clubs and balls. The Callaway Superhot Bold Matte Golf Balls are super long-distance balls with excellent stability over distance and an excellent short game spin and control. Callaway has achieved this by using a three-piece construction with a high energy core, and an ionomer case, with HEX aerodynamics. The HEX aerodynamics are computed for a low drag coefficient and optimal lift which helps give the ball an extended and stronger flight. The ionomer cover is thin, which provides this ball with increased spin and control around the greens. It’s the color combinations of these balls that make them stand out from the crowd, and Callaway have produced them in matte finishes of yellow, red or orange along with standard white. Callaway has been integral to the emergence of colored balls over the years, and these matte colors stand out on the course for easy identification in most conditions. Titleist is the world leader in golf balls with a reputation for producing consistently high-quality balls for golfers of all levels. The Titleist story began when the founder X-rayed a golf ball and realized that the reason he had missed his final shot was due to the core of the ball being off center. There began the pursuit of perfection which is still evident in Titleist’s manufacturing process today, with X-ray checks still forming a part of the quality control process. 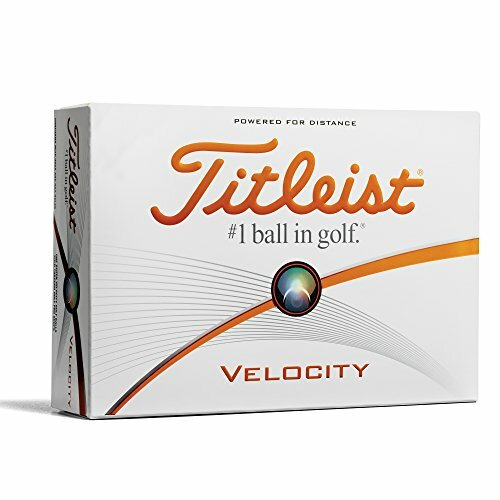 The Titleist Velocity golf ball is specifically designed for initial explosive velocity with low spin, to create a long-distance ball that has great stability in the air to compensate for swing imperfections. Titleist achieves this by using an oversized superfast core with a proprietary LSX material composition making it fast with a low spin factor. The Titleist Velocity golf ball uses a super thin NAZ2 cover which when combined with the large fast core creates high lift for approach shots, and good control and stopping power around the green. The case is engineered with 328 spherically tiled tetrahedral dimples to maximize lift and soaring capacity. Overall this is an excellent quality consistent ball. 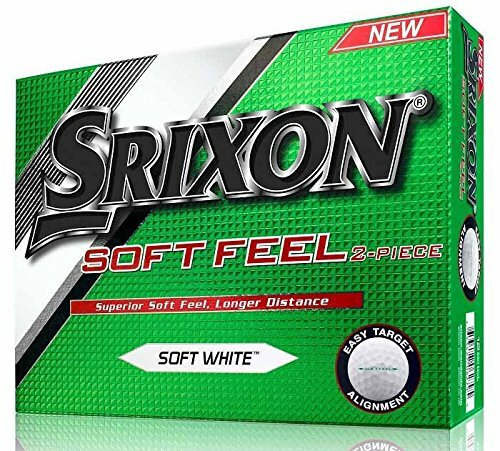 The Srixon Soft Feel Men’s Golf Balls are the 10th generation of this popular two-piece golf ball. Specially design for distance with a soft feel, Srixon uses a soft cover and low-compression core that features an energetic gradient in its design. This produces a soft feel without losing any distance or ball accuracy. The cover is ionomer and has a reduced thickness which allows for higher spin and control around the greens for accurate chips and putting. The Srixon Soft Feel Men’s Golf Balls has a 324-dimple speed design which lowers drag and improves lift and flight over distance. Each ball is marked with a target alignment to assist in ball placement and strike. It is available in both white and also tour yellow for varying conditions and light. The balls we have reviewed will make an excellent purchase for high handicap golfers, where longer distances and more control over long flights is essential to maximize your game. 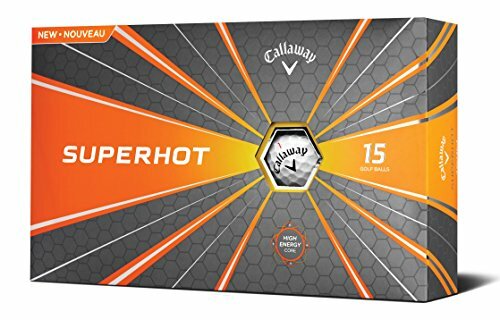 The Callaway Superhot Balls are good quality three-piece balls that have excellent performance characteristics, with good distance and control. Callaway uses a widely used ionomer cover with a HEX design to give the balls exceptional lift over distances and excellent short-range control. I particularly like the new and modern bright matte colors which stand out on the course and in the rough. The Srixon soft feel balls offer an excellent value two-piece solution and are constructed with low compression and energetic gradient core, to give a soft feel without compromising on distance and control. For us, the pick of the bunch is the Titleist Velocity golf balls. Simply put, there is a good reason why Titleist is the world leaders in golf ball manufacture. Using its extensive R&D facility, they have packed this ball with innovative materials and construction methods to ensure you have a golf ball that will consistently give you distance as well as control.